"Roadkill... It's Mad Max versus Grand Theft Auto!" Midway decide to up the ante with their latest game of road rage that increases the violence and language barrier! Unlike many car games, Roadkill has a plot that has been taken from a bad 1980's action movie and features Mason Strong as the vindictive hero who was left for dead by his former gang boss. With hundreds of street gangs roaming the streets of Paradise City and thousands of hookers, it's time to clean up the streets. Roadkill is set in a post apocalyptic world (similar to Mad Max) that has been genetically crossed with Grand Theft Auto. The game begins with a beautiful CGI designed cutscene that helps set the pace of the story and introduces you to the first city that you begin in called Lava Falls. Unlike GTA, Roadkill has a variety of different settings that range from cities ravaged by wars, canyon cities and even utopian cities that allows you to race, main and of course kill. The game itself is mission based and as you travel around the city, you encounter characters that give you missions that must be completed in order for you to rise in the ranks and also to unlock new towns. Missions involve a variety of objectives such as attacking rival gangs, destroying shipping containments and even assassination attempts of rival gang leaders. As with GTA, the missions themselves are extremely varied and range from easy to absurd difficulties. 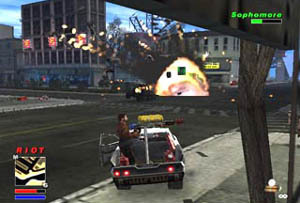 The game also takes the "Kill Frenzy" mode from Rockstar's GTA but it has been translated into "Riot" on Roadkill and once you have collected all these letters, the entire town engages itself into a riotous battle. In order to collect more powerful weaponry in Roadkill, the gamer must scour the entire town for pieces and once they have collected the correct pieces, their weaponry is automatically upgraded. Fortunately, these pieces are located in accessible locations throughout the game. There is also a map in the lower right-hand corner of the screen that helps you navigate through the gaming world. The control system of Roadkill is mediocre and uses a combination of the two analog sticks to move your car in the gaming environment. Although this system was used by Twisted Metal Black, it unfortunately doesn't feel right in this title. By using the shoulder buttons, you control your cars weaponry that range from machine guns, missiles and even flamethrowers. The game also includes over 35 different vehicles that you control during the game but unfortunately the control system effected the accuracy of the title and there were many times that I was driving around in circles because of the dual control system. Graphically, Roadkill is a disappointment and appears to be a first generation PlayStation 2 title with no anti-aliasing in the game whatsoever and extremely "blocky" looking textures throughout the game. 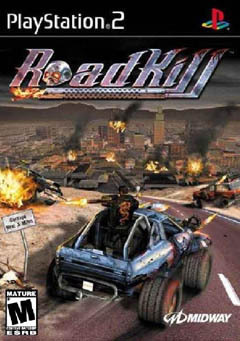 Fortunately the backgrounds in the game, especially in the cities are extremely well modelled and unlike games that only have one or two levels in the cities, Roadkill has quite a bit of variety. The developers have also included some great special effects such as explosions and bullet effects and even some disturbing realistic features such as dragging pedestrians under your car and the way you run over them that make them look like a rag doll. The car models themselves are extremely limited but the developers have done a great job at recreating some accurate damage modelling as bonnets fly up or car doors get knocked off. The game is also extremely dark but this is due to the post apocalyptic nature of the title. The soundtrack of Roadkill is brilliant and features a variety of officially licensed music to help get gamers into the atmosphere of this title. As with GTA, there is also a talkback radio that features some adult content that would make even the most staunchest of gamers blush but then again this title comes with a R18+ rating. The audio of the game is extremely cheesy and contains a variety of four letter "cuss" words that becomes extremely repetitive in this title. 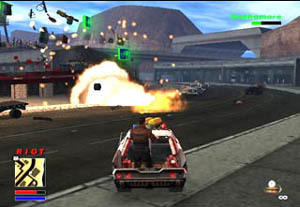 The sound effects in the game, contain the roars of the engines, the gunfire battles of gangs, the thuds of hitting pedestrians and of course huge Hollywood-like explosions. 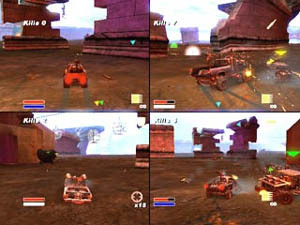 Once the title has been finished (or earlier if you wish), the game also supports an interesting multiplayer option that allows four gamers to engage in a deathmatch mode that is extremely reminiscent of Twisted Metal Black. Unfortunately Road Kill doesn't really have much going for it with mediocre graphics and a fair bit of stolen content from other games. Probably a title that should be "rented" before a purchase is made.